A public tribute to Drummer Rigby in the Staffordshire Moorlands. I’ve attended quite a few emotional press conferences over the last quarter of a century: Press conferences where the parents of missing children, relatives of crime victims and people who have suffered terrible abuses have opened their hearts. But nothing has quite moved me in the same way as listening to the family of murdered soldier Lee Rigby on the radio. The other day I found myself parked up at Cellarhead, waiting for the traffic lights to turn green, with tears trickling down my face as I heard Drummer Rigby’s fiancee Aimee West and step-father Ian Rigby speak for the first time. Their grief was so absolutely raw, their statements conveyed so perfectly their sense of utter incredulity at what had transpired in Woolwich, that I’m not ashamed to say I wept with them. 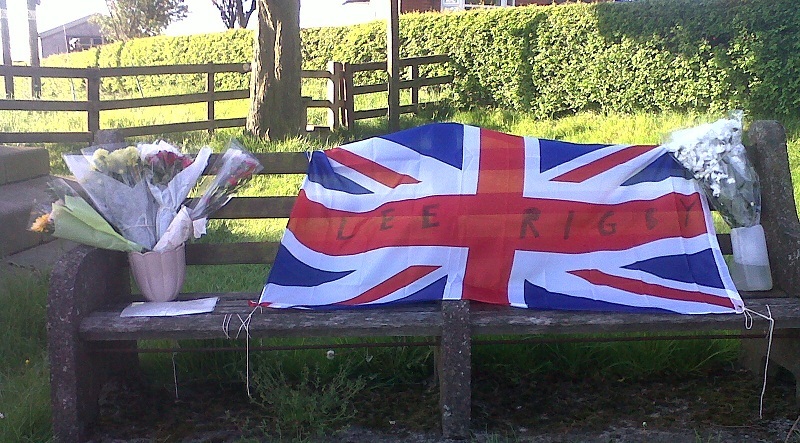 A few days later I was driving through the village of Kingsley in the Staffordshire Moorlands when I spotted a Union Flag bearing the name Lee Rigby tied to a roadside bench and flanked by bouquets of flowers. 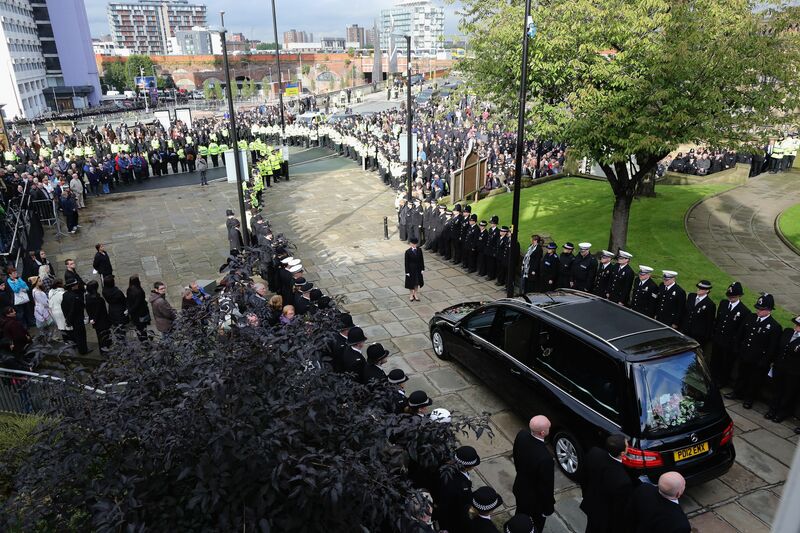 It was a simple, touching public acknowledgement of a tragedy which has stunned a nation. Understandably, politicians of all persuasions have had to tread that fine line between condemnation and conciliation for fear of inflaming tensions between communities across the UK. Sadly, this unspeakable act has been seized upon by extremists associating with organisations such as the English Defence League which are intent on peddling their own twisted agendas. However, the simple truth is that despite what the perpetrators of this senseless killing might wish us to believe, there is no ‘us and them’. 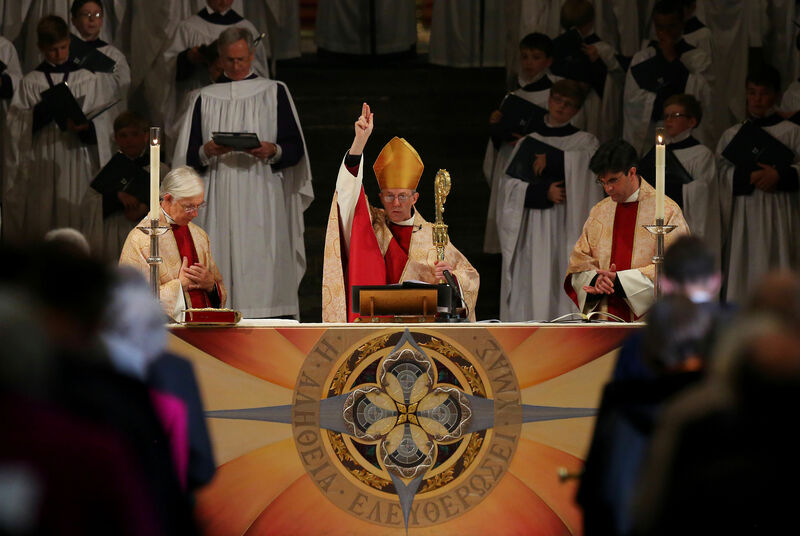 The Britain of 2013 is a hugely tolerant, multi-cultural country where, for the most part, different communities and cultures rub along well. The man with bloodied hands standing on a street in London wanting to spread his bile and hatred and justify the unjustifiable lost the argument the moment he picked up a machete. That was when he stopped being a Muslim. Indeed, that was when he stopped being a human being. If the men who mowed down Drummer Rigby and hacked him to death in full view of shoppers were hoping to strike terror into the hearts of the British public they failed. We all know full well that the risk of any of us being targeted for a repeat of such a heinous crime is miniscule. We are no less safe today than we were last Wednesday. We also know that leaders of all faiths and true followers of Islam have condemned the killers – thereby robbing them of even the slightest shred of credibility or support. Any of us can, by all means, disagree with the Government on anything we like – such as British troops being stationed overseas in countries like Afghanistan. But to suggest that ‘the West’ is somehow staging a war against Muslims – as Drummer Rigby’s killers would have people believe – is utter nonsense. The fact is that the innocent victims of the conflict in Afghanistan have been of all faiths and of none and British foreign policy is not to blame for the death of Lee Rigby. Those awaiting trial for the murder of a young father in Woolwich last week are criminals, pure and simple: Sick individuals who don’t know right from wrong. They haven’t achieved their aim of inflaming racial or religious tensions and they won’t persuade the Government to pull our Armed Forces out of Afghanistan any quicker. However, what they have done is raise some other rather difficult issues for our politicians. Questions like why we, as a nation, are unable to deport criminals who preach the kind of hatred spouted by Lee Rigby’s killers back to their country of origin because of their ‘human rights’. Today, the alarming truth is that there are a number of individuals living in Britain who are cheerleaders for terrorists and we are powerless to get rid of them because successive governments have refused tackle the European Human Rights legislation which actually protects criminals. Our security services can’t possibly monitor or even be aware of every radical preacher or radicalised individual and so, in my book, it would be far better to get shut of the ones we know about. It is high time we followed the lead of countries like Australia and put the safety and well-being of the people of the UK first. One of the great things about our democracy is that people are entitled to believe and say whatever they like – so long as it doesn’t offend or endanger someone else. The great irony is that we seem to take a far tougher stance against people who make remarks which are offensive (because of ignorance) to others of a different ethnicity, gender or sexual orientation than we do against those who claim to be men of god but who preach a gospel of hate. The sad truth is that you’ll have the book thrown at you for an ill-advised Tweet about gay people but you’ll be allowed to stay in the UK and we’ll keep you fed, watered and entertained if you encourage people to become terrorists. Personally, I’d rather not have my taxes paying for food, televisions, game consoles and gym equipment for Lee Rigby’s killers for the rest of their miserable lives. Rehabilitation? Too risky. Chance of parole? Zero. At least I hope so. If it were up to me, if Drummer Rigby’s killers are found guilty in a court of law I’d make sure they receive the Osama treatment and their bodies would be dumped at sea. No doubt this view won’t be popular with some readers who are opposed to the death penalty but I, for one, am through worrying about the human rights of those who show no humanity to others. 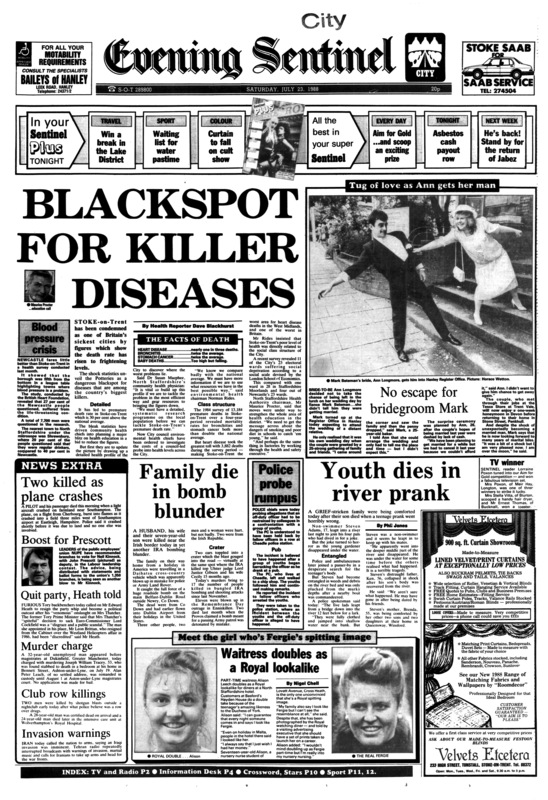 A Sentinel front page from July 1988. I can tell you exactly when I fell in love with newspapers. I would have been about 10 years old and it was The Sentinel that hooked me. My mum and dad had the paper delivered and I would nick the Football Final and sit alone in the back room reading the brief match reports and scanning the league tables. I remember thinking at the time that it was incredible that within an hour and a half of the final whistle a page full of information had been printed on the back of our local paper and delivered to our door. 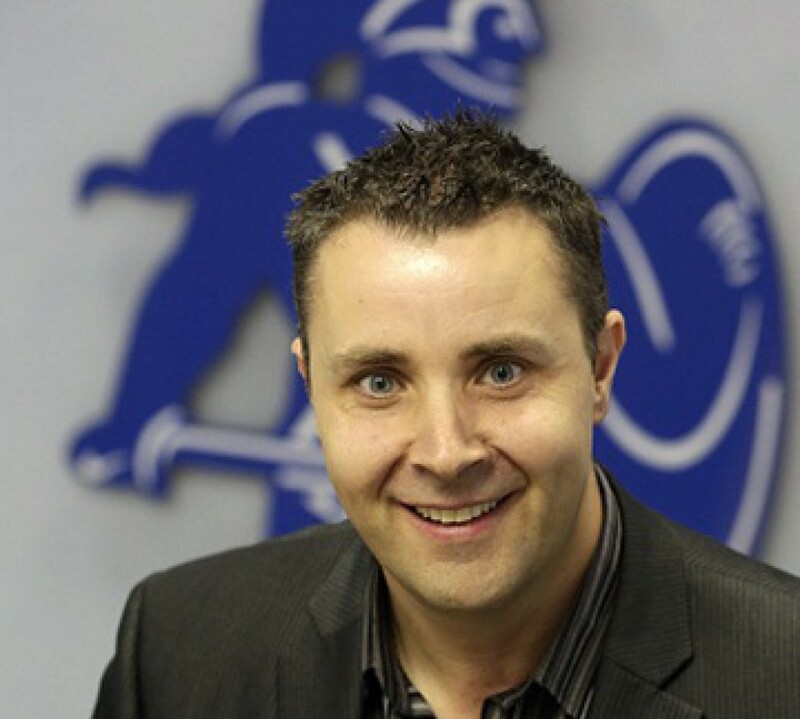 At the age of 15 I began my paper round – delivering The Sentinel and national newspapers to homes in Sneyd Green and Smallthorne. My ‘run’ was very hilly and was the longest of any of the paper boys and girls working out of the newsagents on Mornington Road. The year was 1987 and I would get up at 5.30am on a school day and a similar time at weekends and have to be at the paper shop by 4.30pm each day after school. I earned the princely sum of £5.50 per week but consoled myself with the fact that I lost a stone in weight in three months lugging that great heavy bag around. I remember weekends being toughest because my bag was heavier – filled with numerous lifestyle supplements and magazines which the nationals produced to add value to their reader offer. Being a paper boy helped me to develop a healthy interest in current affairs – from the trials and tribulations of ‘gender-bender’ Boy George to the kidnapping of Terry Waite and the sinking of the Herald of Free Enterprise. I would browse the nationals before delivering them – something my boss Joe frowned upon because he feared complaints from customers irked by papers with creased pages. I slowly learned the differences between each of the tabloids, began to spot the spin and the political bias, and marvelled at how the same story could be told two or three different ways. It was while at Sixth Form College, Fenton, a couple of years after I gave up my paper round, that I applied for a job with a local press agency – determined to carve a career in journalism. It’s no secret that sales of newspapers, both national and local, have been declining since their peak in the 1950s – never more so than following the advent of the internet. Two of the national newspapers I delivered as a paper boy – The News of the World and Today – are no longer with us. The former was shut down in the wake of the phone-hacking scandal while the other, which had only launched in 1986, closed nine years later due to financial pressures. I am proud to say that having delivered both I worked for and had articles published in both during my time as a ‘stringer’ for a local press agency. Back in the mid to late Eighties newspaper circulation figures were still astonishingly high. In 1987 the News of the World was selling an average of 5,360,000 copies a week while the Sunday Mirror was selling almost three million. The Sun was selling almost four million copies daily and the Daily Telegraph 1.15 million copies. The circulation of all these titles, and all regional newspapers has plummeted dramatically over the last 20 years as technology has advanced and the way in which people access information has changed – prompting many observers to predict the death of newspapers. Far fewer people take a newspaper to work and far more work at a computer or have a phone which gives them instant access to all the news, sport and features that they want. However, in the week that politicians carved a highly unsatisfactory deal between themselves and anti-Press activists, I’d like to think there’s life in the old dogs yet. Blogs and the broadcast media are all well and good but, in the final analysis: No-one does in-depth like newspapers; No-one chronicles history like newspapers; No organisations do investigations like newspapers. No other media organisations have the resources to do what newspapers like The Sentinel do here in North Staffordshire. That’s our USP and that’s why, in my opinion, even in this age of ever-changing technology newspapers still have a vital role to play.